A detailed audit of all insulation in the yard to define the characteristics of every insulator and assess its suitability to operate under the existing ambient conditions. For insulators identified as under-dimensioned for the pollution severity of the site, the design and application of INSILSHED HTV silicon-rubber shed extenders to create profiles and creepage distances to ensure reliable, maintenance-free performance. Coating the insulators and shed extenders with INSILCOTE RTV silicon-rubber to provide the insulator surfaces with uniform hydrophobic properties to further enhance their resistance to flashover. Represents a permanent pollution flashover solution for substations, in stark contrast to the limited effectiveness of washing programs and the prohibitive fiscal and environmental costs of greasing. 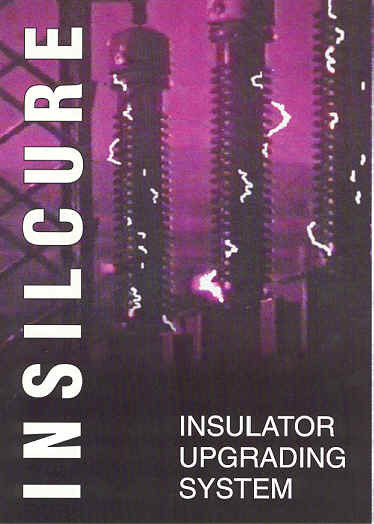 Identifies the "weak links" in the yard, and elevates the quality of all the insulators to an acceptable standard. Provides insulators with a uniform, highly hydrophobic surface characteristic to prevent flashovers induced by both pre-deposited pollution layers and instantaneous conductive fog contamination. How to start: the best way to assess the pollution severity would be to use The Dust Gauges. You can undertake a widespread survey at low cost. Further, as it will be a standard measurement technique in the new IEC 60815, the results obtained can be meaningfully interpreted and universally compared. Contact us to order dust gauges. We can organize a training course for your people on this subject.